Jamie interviews and performs with one of his favourite jazz artists, Diana Krall. The vocalist, pianist and songwriter talks about her latest album and diverse musical influences. 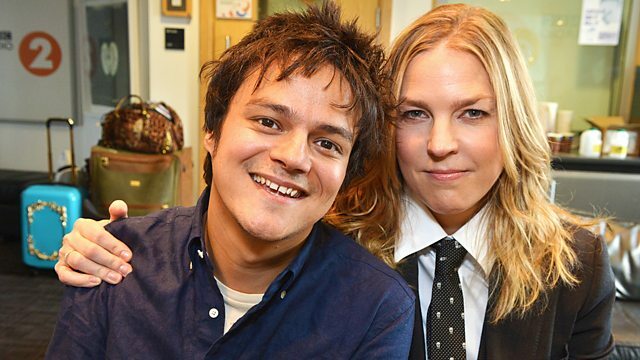 Jamie Cullum plays an hour of jazz music ranging from its heritage to its future and interviews one of his favourite jazz artists, Diana Krall. The vocalist, pianist and songwriter talks to Jamie about her latest album, Glad Rag Doll and they discuss her diverse musical influences, which include their mutual favourite Elton John. The pair also use the opportunity to perform a track together at the Elton John piano at Radio 2. The Face Of Mount Molehill. Gift Of Music – Japan Earthquake / Tsunami Relief.